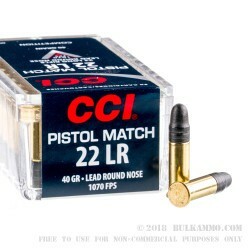 Ridiculously accurate, the CCI Pistol Match is a sublime load for target use in match accurate handguns that need to harness their potential. The 40 grain projectile and immaculate quality control of this load makes it a fine juxtaposition between the classic .22 long rifle you remember, and a handcrafted load that can punch the same hole time and again. 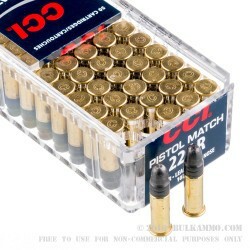 High tolerance firearms need high tolerance ammunition, and this .22LR ammo is about as good as it gets for the handgun market. The very consistent 1070 velocity and the 100 ft. lbs. of energy are interesting numbers, though ballistics aren’t the point with this cartridge – the consistency and accuracy is the name of the game. 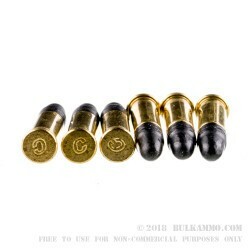 Pricy, yes, but this ammunition delivers predictable, tight groups at obscene ranges relative to regular loads. For match purposes, the round simply delivers what you want to see on target time and again. 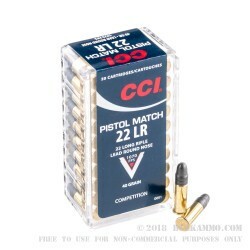 If you have a realistic high tolerance firearm that is well suited to this cartridge, you can all but guarantee single ragged holes on target every time you’re on the range. Suitable for any .22LR firearm but purpose built for handguns with high tolerances and which are positioned to shoot in matches.